The survey is now closed. Thank you for your input. Check back in on the project page for future updates. This survey is an important part of the Downtown Sugar Hill master plan update. Scheduled to conclude in the Spring of 2018, the resulting plan will serve as a guide for the city on economic development, land use and transportation decisions over the next decade and beyond. It should take you somewhere between 15 and 20 minutes to complete. Your input will provide the project team with valuable insight into the community's values and aspirations for future development in Downtown Sugar Hill. We really do want and need your honest feedback. The survey is anonymous so please "tell us like it is". Before you begin though, please take a moment to familiarize yourself with the study area map since most of the questions relate to this particular geographic area. Click on the map below to open a full size image. 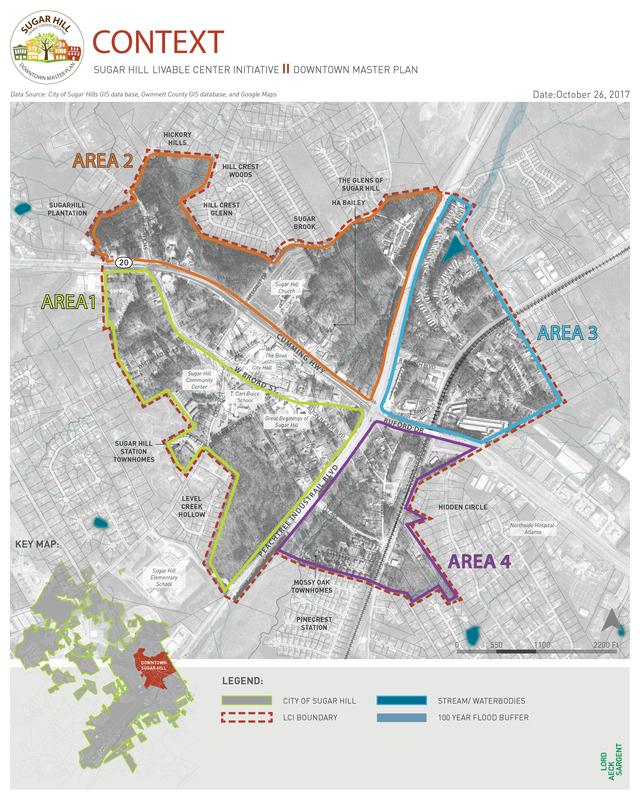 This planning study is being carried out using grant funds awarded to the City of Sugar Hill by the Atlanta Regional Commission (ARC) under the Livable Centers Initiative (LCI). The study area is about 520 acres extending a mile or so along Highway 20 and Peachtree Industrial Boulevard. It includes the core downtown area on West Broad Street, E Center, Sugar Hill Church, former Sugar Hill Elementary/T.Carl Buice School, cemetery and older residential neighborhoods between Peachtree Industrial Boulevard and Railroad Avenue.